Oh, Bombay! Isn’t it the most populous, cosmopolitan, stylish, commercial, liberal, rich, Bollywoodish place in the whole of India? Take my word for that, it is. 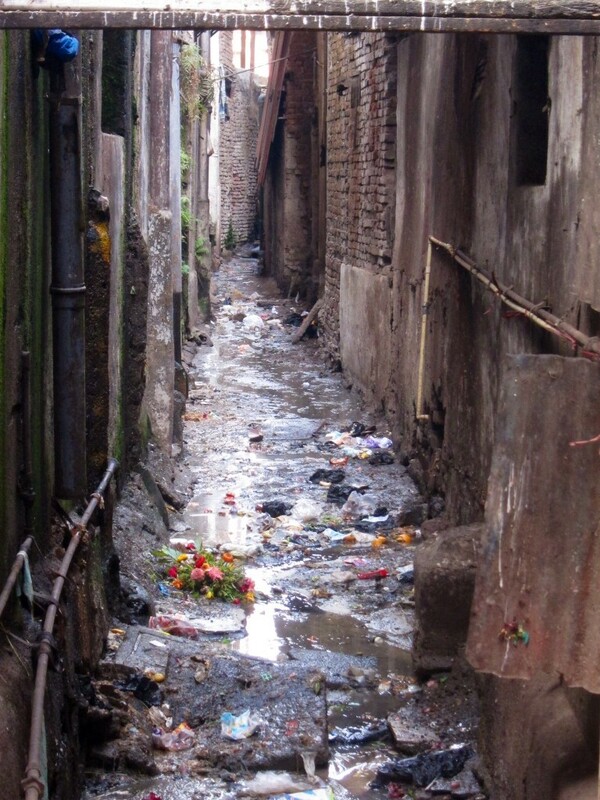 But also, it is home to infamous Mumbai mafia and the world largest slums (with 60% of Mumbai’s population living there). 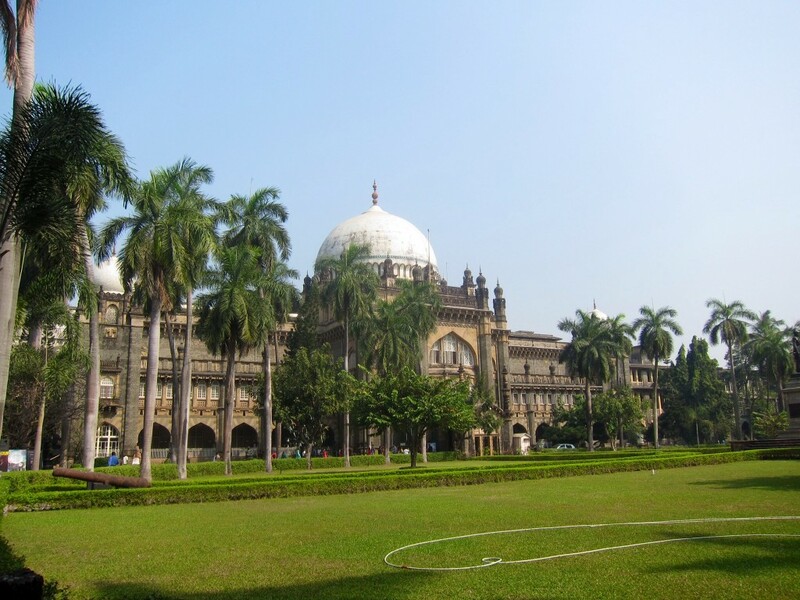 Most Indians would still call Mumbai by its Portuguese name – Bombay, and there is an on-going debate regarding the original name of the city. Some say, that Mumbai is a derivative of two words “Mumba” (the name of local goddess Mumbadevi) and “aai” (“mother” in Marathi), while Bombay is an anglicized version of Portuguese “Bom Bahia” – “beautiful beach”. Seven Islands compose the city and like most things in India, its history goes back far in time, precisely to 1498 when the islands were taken by Portuguese from Sultan of Gujarat. They built a settlement, churches and forts, however, without a clear idea of how to use the islands, they handed them over to England in 1661 as part of the dowry of Catherine de Braganza when she married Charles II of England. Apparently, the British king had no use of the islands either so, in 1668, he leased them to the East India Company for £10 a year. The Company built the ports and center of the city, as well as started a process of joining all the islands into one piece of land. The construction of the port attracted many industries and business communities to the city, thus laying ground to the diversity of the city and its commercial success. Dimitris and I arrived to Mumbai on time, took a taxi (Rs.500) from the airport and 45 mins later checked-in into a beautiful Taj Mahal Palace Hotel. After 10 days of traveling and staying in different hotels, Taj Mahal Palace was all we wanted from Mumbai and more than we hoped to get from a hotel. It is a piece of art, monument of history and an extraordinary experience, all in one! Upon seeing our room in the Palace section of the hotel, Dimitris express his desire never leave the hotel for the entire stay in Mumbai. I, frankly, shared the same wish! This stunning hotel is a Mumbai’s landmark and perhaps, one of the most famous hotels in the World. 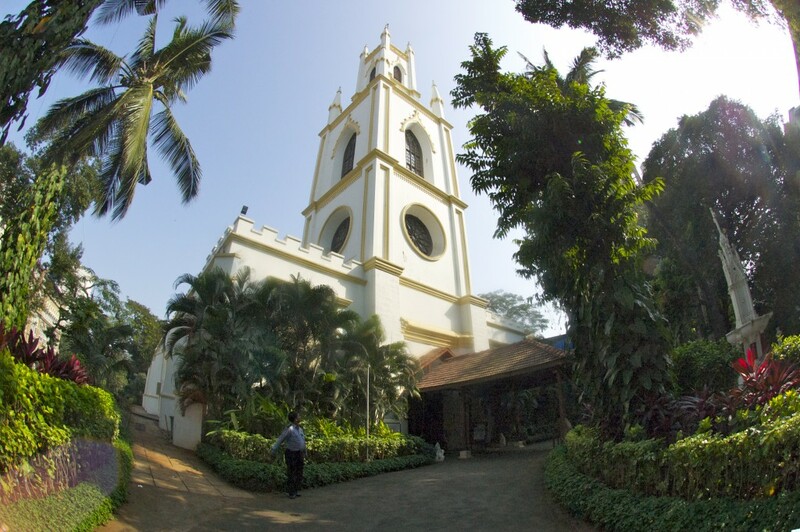 It was built in 1903 by Parsi industrialist JN Tata (founder of Tata group) supposedly after he was refused entry to one of the European hotels in the city on the account of being “native”. It is a beautiful building, designed in impossible blend of 8 different styles and equipped, since its beginning, with the latest technological inventions. But of course, it is not the marble or design, the cotton count of the sheets or the bathroom toiletries that make this hotel great, it is the impeccable and attentive service, it is an “extra mile” everybody were willing to go in order for us to enjoy ourselves and of course, it is a “wow” effect we got from pretty much everything – beautiful tibetan mandalas in the room, access to an Oxford-like lounge with complementary drinks, restaurants and bars of the hotel and so on. 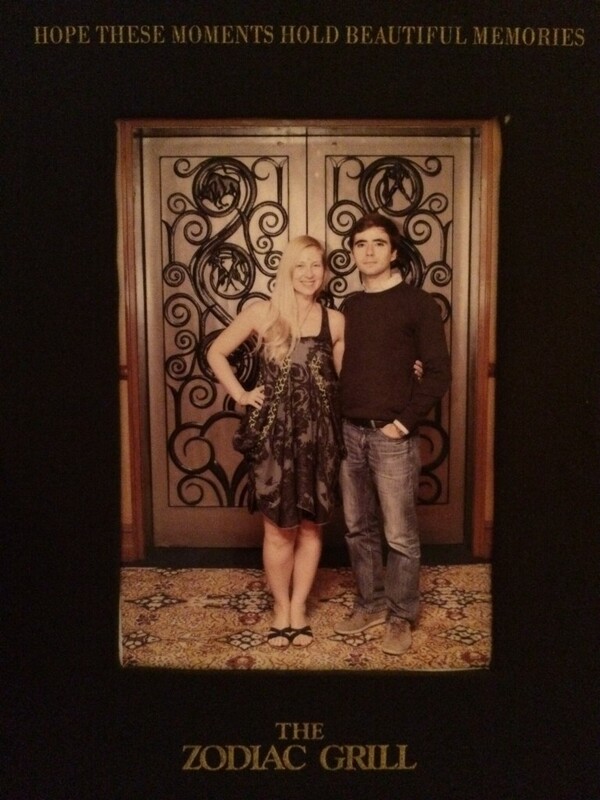 I was so happy on insisting to stay at this particular hotel, and i hope Dimitris was happy too. After dropping off our luggage, we went for dinner to Zodiac Grill – one of the best romantic restaurants we’ve ever been. We ordered non-vegetarian tasting menus for both and spent an evening, worshipped by attention of our two Goan servers, Anthony and Domnic. They were professional, well-mannered and delightfully pleasant. Our first evening in Mumbai gave a promising start and well-needed refuge! In the morning, after having our morning coffee at the lounge, we came to the concierge desk to find out about things to do in Mumbai and Viren A. D’Sa, the Taj’s Experience Manager was an experience himself. He, perhaps, is one of the best people suitable for the hospitality business, I have ever met (but I guess it applies to everyone we met at the Taj). He was super knowledgable, entertaining and friendly. He wasn’t a concierge (and he seemed to be on the run when we approached the desk), nevertheless, he spent 15 minutes telling us where to go and what to see in details. We grabbed the map he handed to us and walked out eager to explore. Unlike Delhi, Mumbai has very few things to see. Indeed, Brits invested in building the city center, but after the Independence, Indian’s zeal to wipe away all traces of colonial rule was, unfortunately, not matched by the same enthusiasm to build a new city. Skyscrapers popped up in some parts of the city and old Victorian buildings were given names that a non-Hindi speaking person could never pronounce, but most of Colaba (southern Mumbai, where we stayed) represents a fair amount of Art-Deco buildings in a pretty good conditions. In general, we thought that Mumbai was by far the cleanest and most organized place we have so far visited in India, perhaps, it is partially due to a ban on tuk-tuks within 20 kms of city center. Our taxi driver told us that the reason for it was that “tuk-tuks don’t follow the traffic regulations and create chaos in the city”, as if somebody else did follow traffic regulations?! 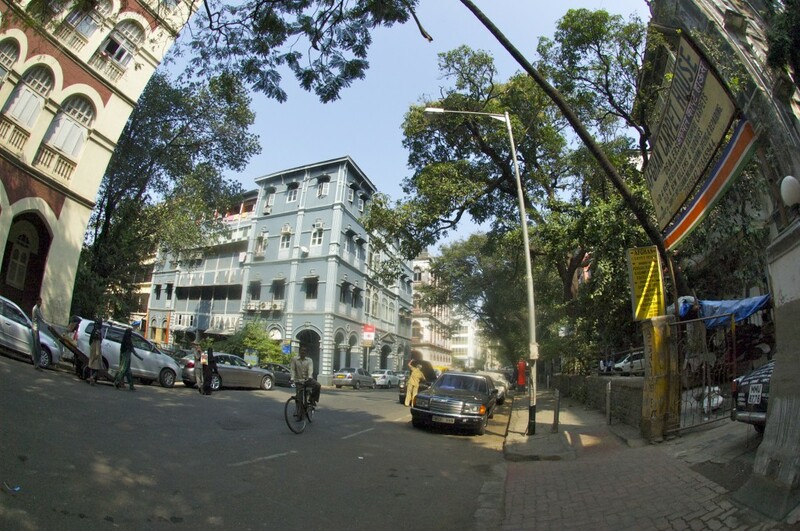 We walked down Merewether road, then turned right to Arthur Bunder and later to Colaba Causeway, a sort of a street shopping heaven for cheap shawls, bags, clothes and bijouterie. Then we proceeded north, passed a stunning Prince of Wales museum building (Indian name – Chhatrapati Shivaji Maharaj Vastu Sangrahalaya) to a small art street where I bought a few decorative paintings drawn on tree-leaves. We walked by the Naval Dockyard with a huge mural painted on its wall, towards the St. Thomas Cathedral. Built in 1718, it is the oldest English building in Mumbai, done in Byzantine and colonial-era architecture with a lot of tomb stones lining up the inside walls. 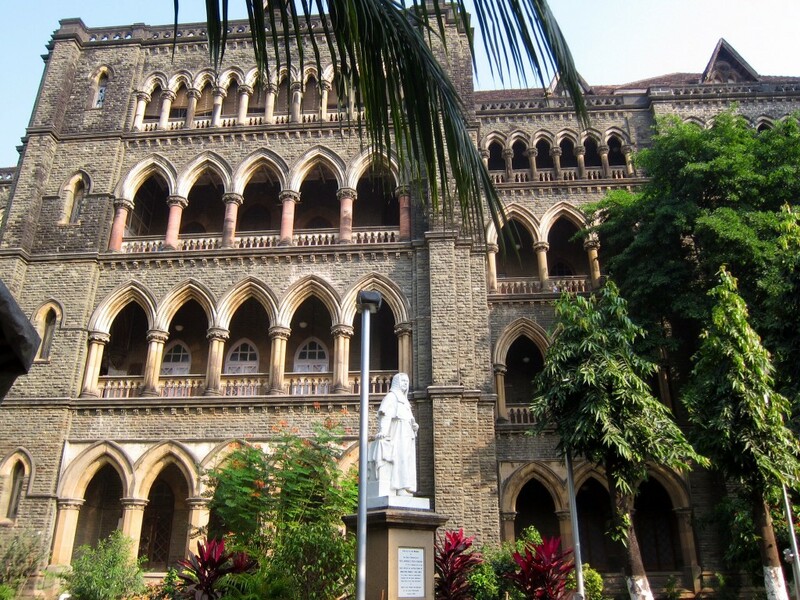 After lunch at Tata’s Starbucks, we continued to University of Mumbai and High Court. Both buildings were closed for renovation or vacation, so we weren’t able to walk inside and admire their Gothic style. Our goal was to check out Victoria Terminus Train Station building (locally known as Chhatrapati Shivaji Terminus), which indeed had the most extravagant Gothic architecture of all. As historian Christopher London put it “the Victoria Terminus is to the British Raj what the Taj Mahal is to the Mughal empire”. Designed by F. Stevens, it was completed in 1887 and today, it is Asia’s busiest train station and a World Heritage sight as well. True to its reputation, it was so overflown with people that it forced us to run away and look for a refuge at the Crawford Market. 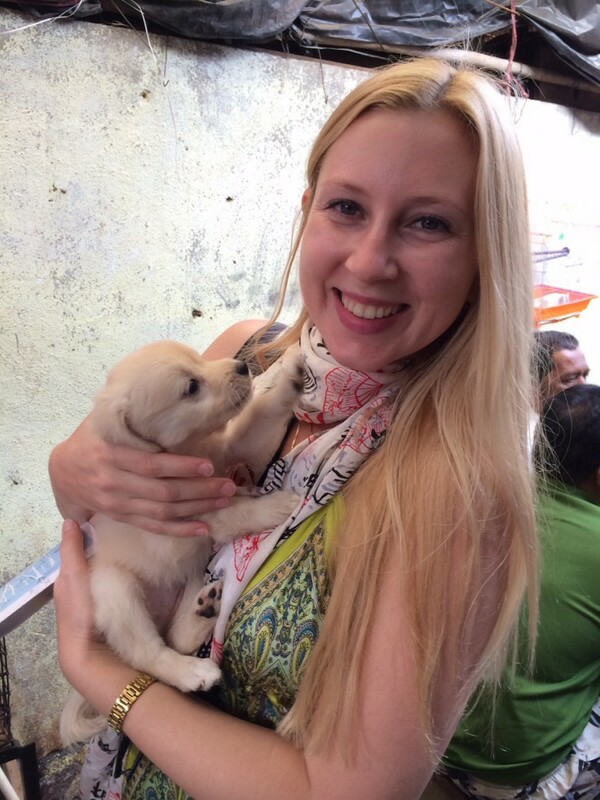 As Viren told us, Crawford market was a place where we could buy everything and he meant “e-v-e-r-y-t-h-i-n-g”, from fruits to postcards to souvenirs to puppies. Because it was Sunday, half of the market was closed so, while trying to get rid of an “I-am-a-security-and-you-can’t-walk-on-your-own-here annoying man, we checked out a few cute pets and took a taxi (Rs.70) to Marine Drive and Girgaum Chowpatty, also known as Corniche and “the Queen’s Necklace” to enjoy warm (+30C) weather and a beautiful Arabian Sea sunset. 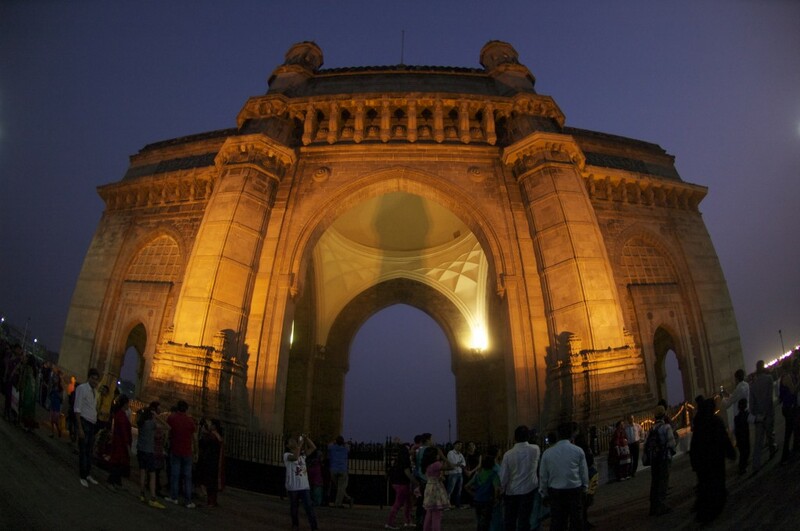 We took a taxi back and before going to the hotel, walked around the Gateway of India monument for some fantastic shoots. It was built to commemorate the 1911 royal visit of George V, but not completed until 1924. At any time of the day, it was always full of locals, taking pictures and people-watching. 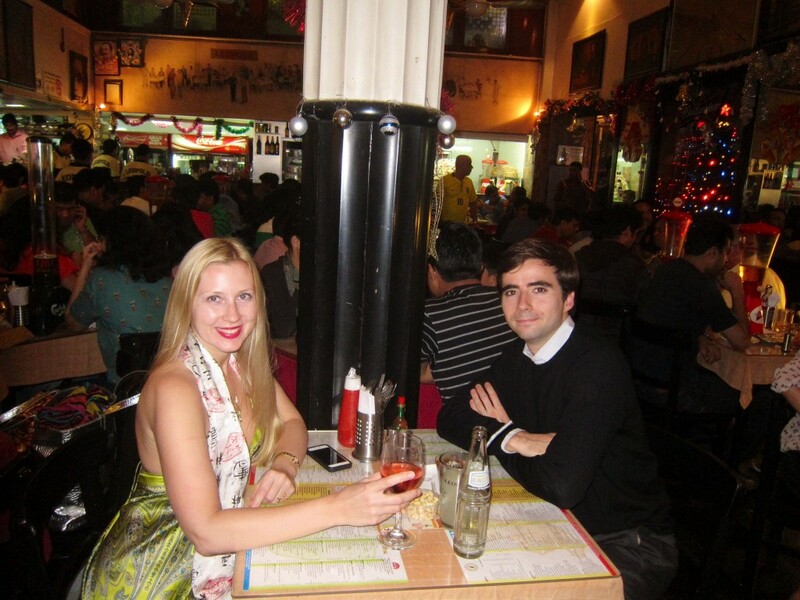 After returning to the hotel, we grabbed some snacks at the lounge and went to a famous (read “Shantaram“) and super busy Leopold Cafe for dinner. I had a 10 am appointment with a hotel’s astrologer who, besides reading my stars’ chart, gave me a magic date to keep in mind. After we had a breakfast/lunch at the Middle Eastern restaurant Souk and checked with a concierge whether it was possible to go to the Elephanta Island to see the caves. Unfortunately, it was Monday, and the caves were closed, but we were given a few names of local markets to check out. Chor Bazaar (or the Thieves Market) was the most appealing to me as i wanted to check out some antique stuff. Dimitris and I planned to meet our classmate Mihir at 5 pm to attend a tour of Taj Mahal Palace together. 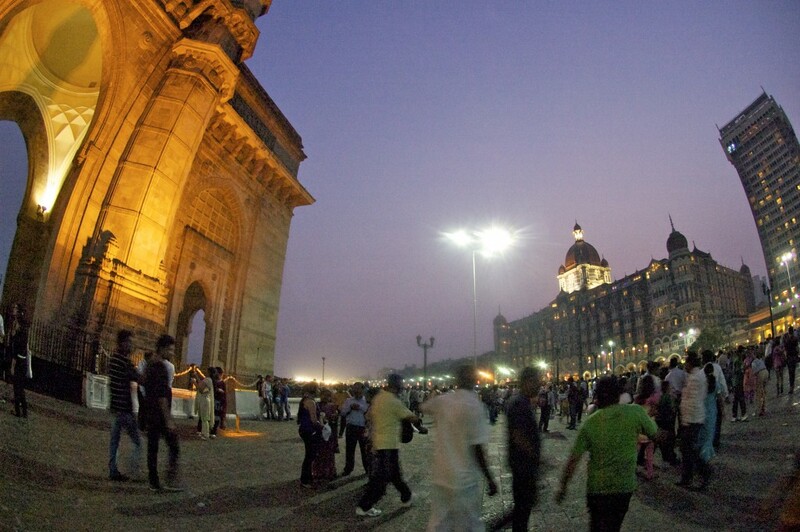 It was a fascinating story of the hotel, told by our favorite person at the Taj – Viren. I believe many hotels in the world could borrow an idea and start organizing hotel tours, but very few of them would have such a vibrant and eventful history as Taj Mahal Place, from its inception in 1903 to the terrorist attack in 2008 to the current celebs staying at the hotel (Scarlet Johansson and Russell Brand). After the tour, we dropped by Sea Lounge for some tea and juice before heading to Khyber restaurant, highly recommended by everyone in Mumbai. 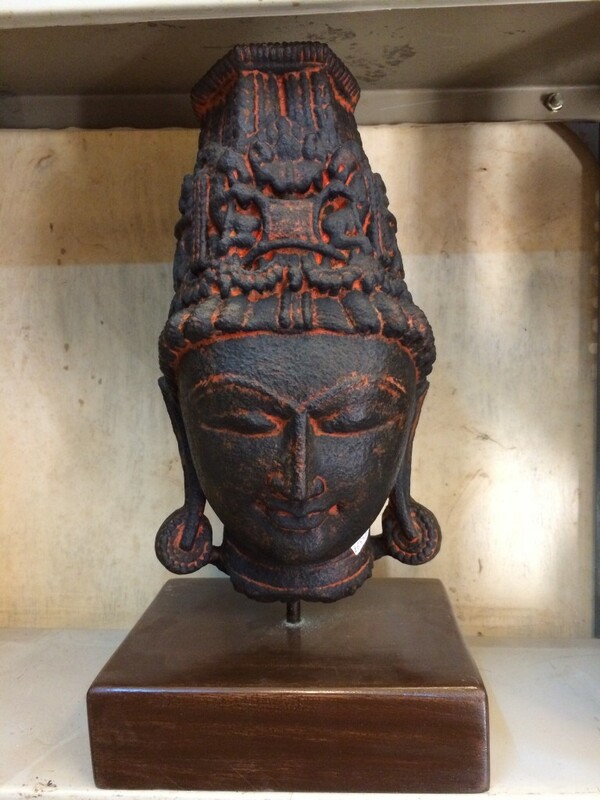 It is a lovely, lavishly decorated restaurant serving a north India cuisine. 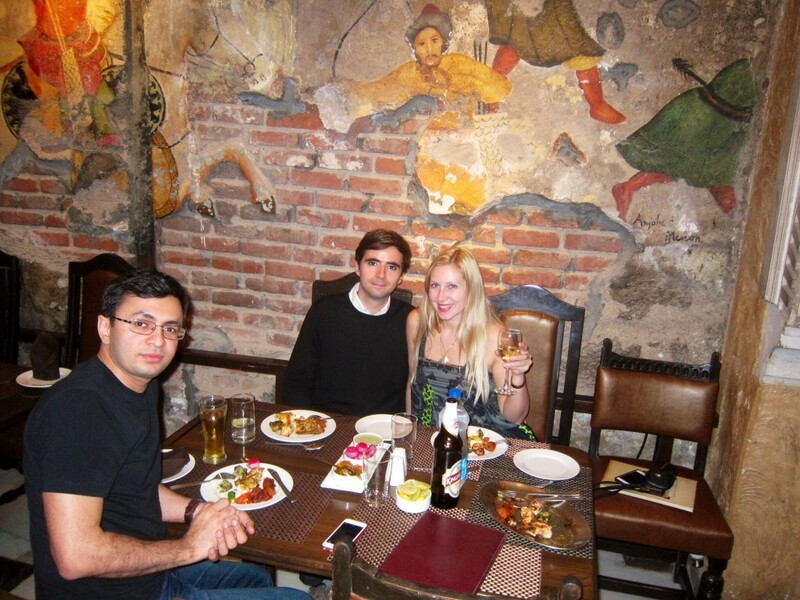 We ordered an appetizer and some samples of meet kebab for the main course, as well as desserts. Everything was delicious. After the dinner, we continued to the stylish Harbour Bar, back at Taj Mahal Palace – the first bar in Mumbai to acquire a liquor license in 1933 – to try their signature cocktail from the Prohibition era. The story behind the cocktail is that a few Americans who had their boat moored by the Gateway of India heard about the abolition of prohibition in the US, entered the Harbour Bar to celebrate and demanded a cocktail which would blow them away. The bartender used Indian fruit juices to concoct a cocktail that is now known as Harbour Bar 1933. Our bartender came to the table to demonstrate the preparation of the drink before our eyes. Not only was his show impressive, but also the drink was delicious. After saying goodbyes to Mihir, we went back to our room to pack and get some sleep before flying off to Mysore. Mumbai isn’t rich in history, but for us, it was a piece of paradise because of Taj Mahal Palace. 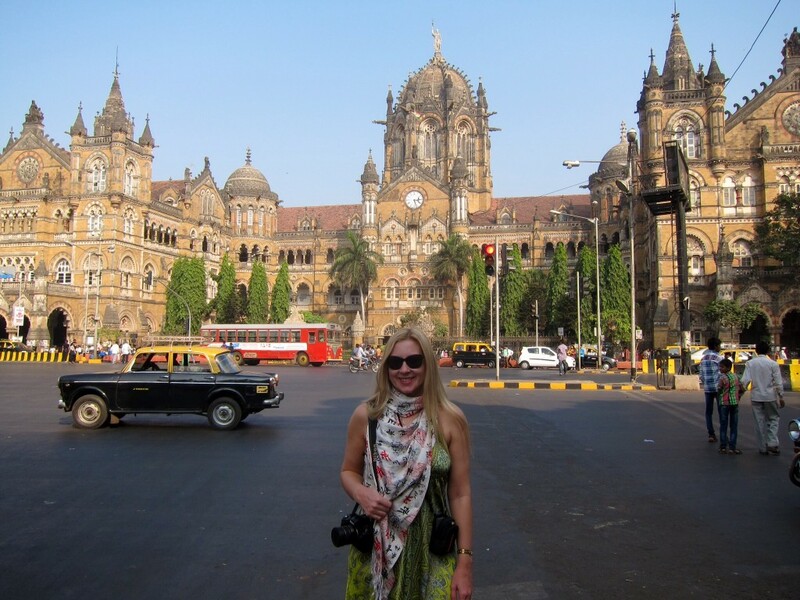 So, my advice if you plan to visit Mumbai – book the Taj, get your swimming attire in order and enjoy the amenities! The rest of the world can wait! This entry was posted in Asia and tagged Bombay, Bombay Dockyard, Bombay High Court, Catherine of Braganza, Charles II, Chhatrapati Shivaji Terminus, Chor Bazaar, Corniche, Crawford Market, East India Company, Gateway to India, George V, Girgaum Chowpatty, Harbour Bar, India, JN Tata, Khyber, Leopold Cafe, Marine Drive, Mumbadevi, Mumbai, Naval dockyard, Prince of Wales Museum, Sea Lounge, Shantaram, St. Thomas Cathedral, Taj Mahal Palace, Taj Mahal Palace Hotel, Tata Group, The Queen's Necklace, Thieves Market, University of Mumbai, Victoria Terminus Station, Zodiac Grill. Bookmark the permalink. ← Aurangabad, India. December 2013. 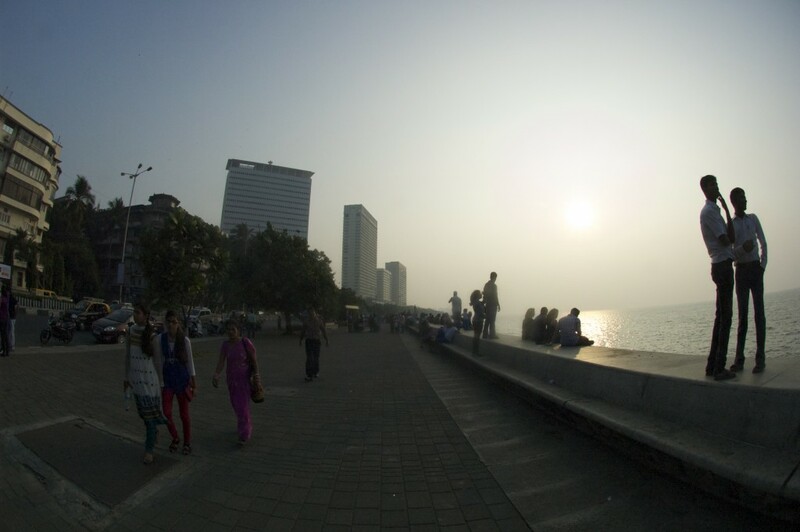 This is a brilliant Capture of the Bombay City…. Am really glad you didn’t just visit but experienced our City. Very interesting perspective about Mumbai in the form of a story. It’s impressive!